Born in Carbonara di Po, near Mantua, on 17 January 1449, Osanna d'Andreasi was the daughter of Niccolò Andreasi and his wife, Agnese Gonzaga. Her family belonged to the nobility, but whether Agnese Gonzaga was related to the Gonzaga family, rulers of Mantua from the mid-fourteenth to the early eighteenth centuries, is not clear. St. Catherine of Siena provided Dominicans, especially Italians, with a new model of spirituality which was not only mystical but political, directly concerned with the reform of Church and State. A century after her death this model was strikingly exemplified by Dominican men . . . but comparatively little attention has been given to Dominican women . . . who just as faithfully followed in Catherine’s footsteps. One of these on whom we are best informed is Osanna D’Andreasi. Osanna's life and faith are documented by two contemporaries who knew her and who wrote about her shortly after her death: the first of these biographies, Beatae Osannae Mantuanae de tertio habitu ord. Fratrum praedicatorum vita, was written in 1505 by the Dominican scholar Sylvester of Ferrara. Two years later, another life, Libretto de la vita et transit de la b . Or . 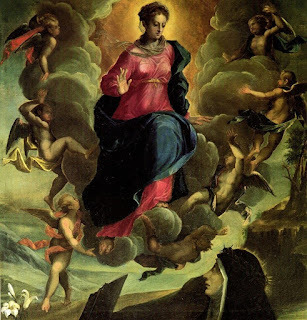 from Mantua, was completed by her confidante, Father Girolamo (Jerome) de Monte Oliveto, a Benedictine monk whom Osanna would come to consider her "spiritual son." His biography is comprised of extended accounts of Osanna's spiritual experiences, relayed to him through conversation. He also appended twenty-four letters by Osanna to his account of her life. In the same spot, she later experienced a vision of Jesus as a child wearing a crown of thorns, and later still met him again, this time in the family garden. Called to the religious life, the girl was said to have begged her father to let her study theology--when denied, she received instruction from the Virgin Mary herself. And since her father didn't think that, as a girl, she needed to learn to read and write, another legend says that--like Catherine of Siena--she miraculously recognized the words "Jesus" and "Mary" one day, and from that point on, she could read. When she was eighteen, she experienced yet another vision in which she experienced a mystical marriage to Jesus. For the following twelve years, while the Italian city-states suffered invasion and war, she prayed to be able to share in the sufferings of Jesus. At the same time, she assumed the burden of caring for her many brothers and sisters after her parents' deaths. In addition to experiencing visions, Osanna Andreasi received the stigmata, first on her head, then her side, then her feet. As Ashley describes the particular of these manifestations in Osanna's case, "the stigmata do not seem to have bled, but simply to have appeared as red, intensely painful swellings. She kept them hidden from everyone except her servants, but at times the pain in her feet was so great that she was unable to walk." Her piety, her acts of charity, and her spiritual experiences brought her to the attention not only of the people, who began to look to her as a spiritual adviser, but also to the ruling Gonzaga family, in particular to Isabella d'Este, marchesa of Mantua, for whom Osanna Andreasi became a spiritual adviser. In 1501, after waiting thirty-seven years, Osanna was finally able to take her vows as a Dominican tertiary. She died four years later, on 18 June 1505. In 1515, at the request of Isabella d'Este, Pope Leo X established a feast day for Osanna in Mantua. She was beatified by Innocent XII in 1694. Today Blessed Osanna of Mantua's remains are enshrined in Mantua, in the Cattedrale di San Pietro apostolo. There is also a museum dedicated to her in Mantua--you can see a gallery of images of the House of the Blessed Osanna by clicking here. 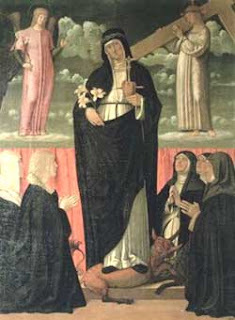 In addition to Ashley's "Blessed Osanna d’Andreasi and Other Renaissance Italian Dominican Women Mystics," cited above, there is an account of Blessed Osanna of Mantua in Short Lives of the Dominican Saints (the author of which is, no kidding, given as "A Sister of the Congregation of St. Catharine of Siena). *Like the Franciscans, the Dominicans also had a "third order": those who, for a variety of reasons, could not take formal vows to join a religious order, could live as a lay person, outside the community according to the ways of life of those who live inside.